We were in the mood for some creative collaboration and wanted to capture it in a artistic styled shoot video. Together with fellow wedding service providers we came up with the idea of a styled shoot, that would represent the uber-popular “glitter and pink” trend in a fresh way. 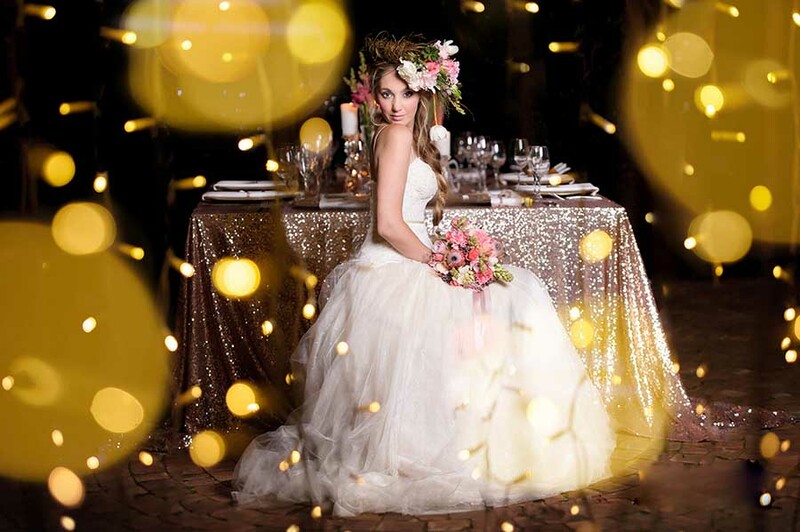 We wanted to incorporate the sequin table cloths and fairy lights and combine it with the elements of nature. And nothing says nature better than Cape Town proteas! That’s how Sparkle and Blush styled shoot video was born. We called our friends at Weltevreden Wine Estate and got them all excited about the shoot. So we had the concept and the venue! Our models were Adriaan and Anthea, SA Weddings Bride of the Year. This gorgeous girl has got a hair of a mermaid, that goes way past her waist. But Alma, our makeup artist, already had a plan for Anthea’s hair and makeup! As we captured our styled shoot vide, Alma turned and twisted Anthea’s hair into a perfect braid, crowned with flowers. Our model was going to wear one of Janita Toerien fabulous designer gowns and a flower crown provided by Bunches for Africa. Within hours so many amazing wedding service providers joined us on this creative collaboration! We needed to literally fill the bedouin tent with fairy lights for the purpose of this styled shoot video. Eric from EC Lighting and his team spent two days suspended from the ceiling, mounting kilometres of fairy light inside the tent for our styled shoot video. The effect is spectacular, they created a night sky under the roof! Our lavish sequin tablecloths and table decor were provided by Exclusive Hire. They reflected the sparkle of the fairy light beautifully. We couldn’t believe we created the fairytale castle from lights and decor! Anthea and Adriaan enjoyed posing among the lights and sipping bubbles. “Sparkle and Blush” styled shoot video will remind us of this spontaneous creative collaboration and the night of fun we had at Weltevreden. We would like to thank all our wedding friends for donating their time and resources into creating this unique styled shoot video!